taught me to minimize minimize minimize! Only leaving for 2 days, and I brought backup pairs of sweatpants, work shoes, and windbreakers?? Beware: The next person who visits me in Paris will be going back to the States with gluten-free cookbooks and old sweatpants. 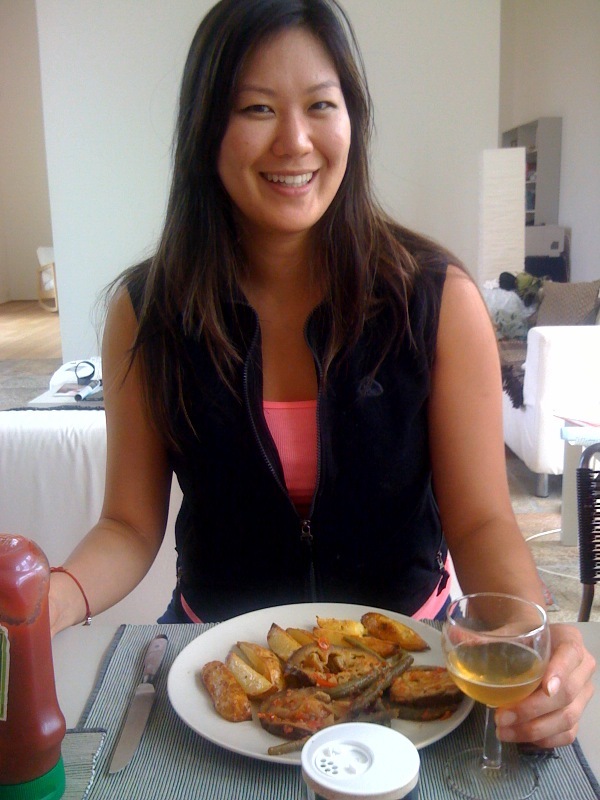 What I really loved is that even though we were working, it was extremely important to stop and have breakfast, lunch, dinner, and tea/afternoon break at the appropriate times. We cooked, set the table, had coffee and tea, and took our time. It’s a lot of the reason why I’m attracted to the French lifestyle – I feel Europeans treat themselves to daily luxuries – hour and a half lunches, two mandatory coffee breaks during the day. Nothing is so important as to interrupt mealtime. Actually, French people get quite upset when you call at noon, because everyone’s at lunch. 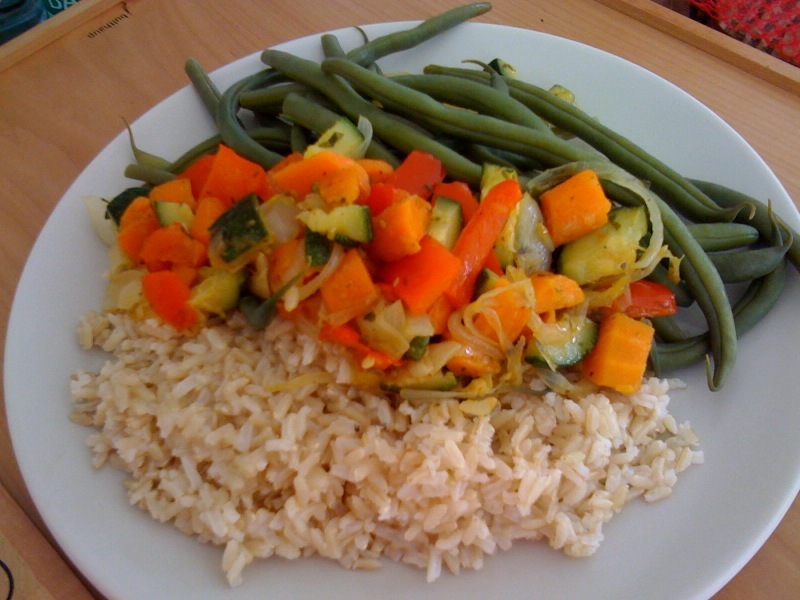 brown rice and veggies! that’s what strippers eat to stay thin in Showgirls (1995) with Elizabeth Berkley – you know that smarty-pants girl with big curly hair from “Saved by the Bell”? 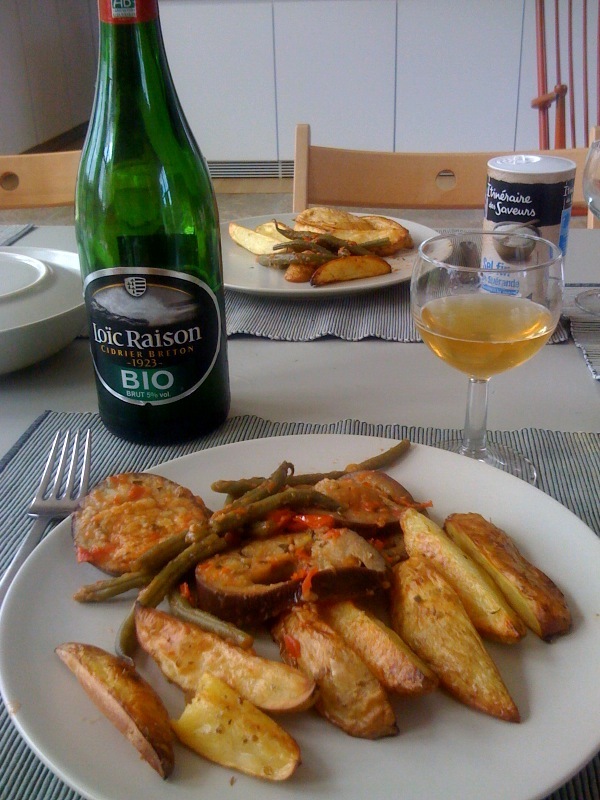 organic apple cider, roasted potatoes, provencal style eggplant and haricot verts. bon appetit! The family who lived here are quite interesting. They’re of Danish descent, and the parents moved to France in their early 30s. The father is a classicial musician, the mother is a translator (Danish, English, French), and they completely renovated the house. Meaning they gutted everything, built floors, did all the plumbing and wiring themselves. 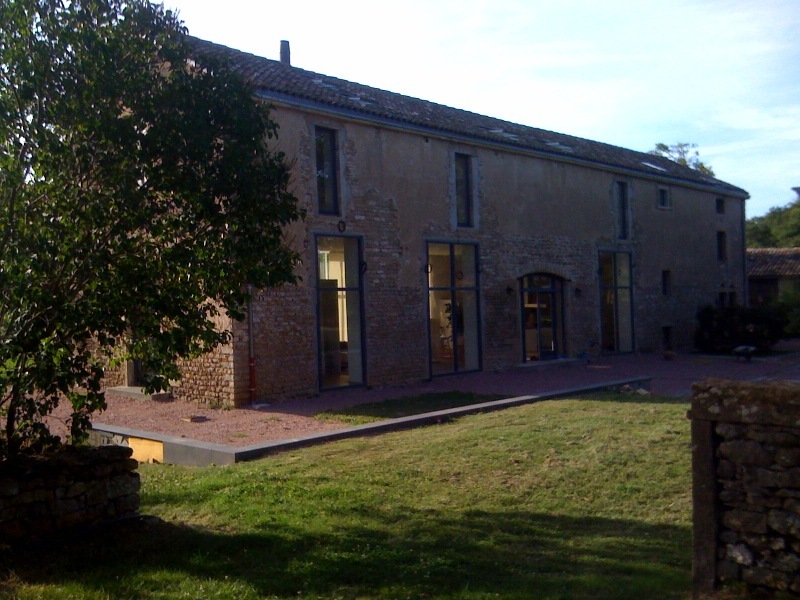 They spend summers here and live in Lyon during the year. Lon is the gastronomical capital of France, in the southern part of the country. 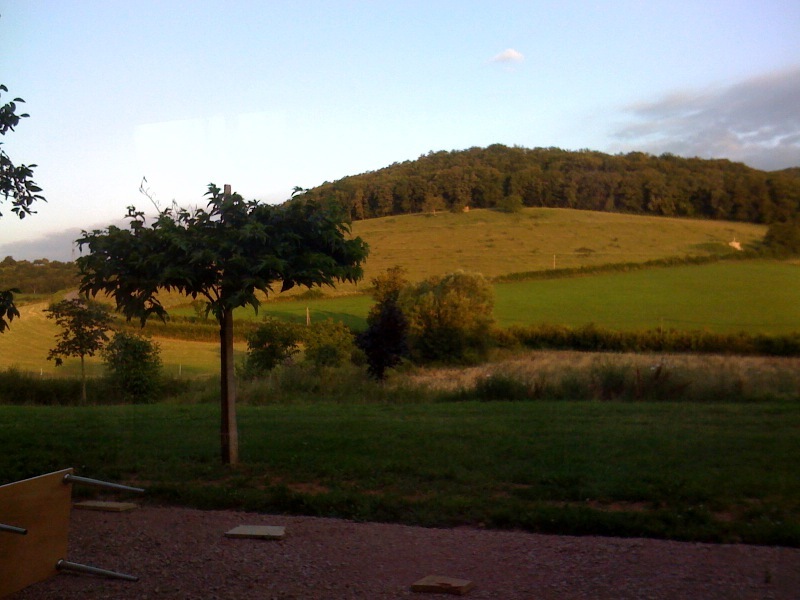 After meals, we took walks in the countryside, staring out at fields of cows and bales of hay. 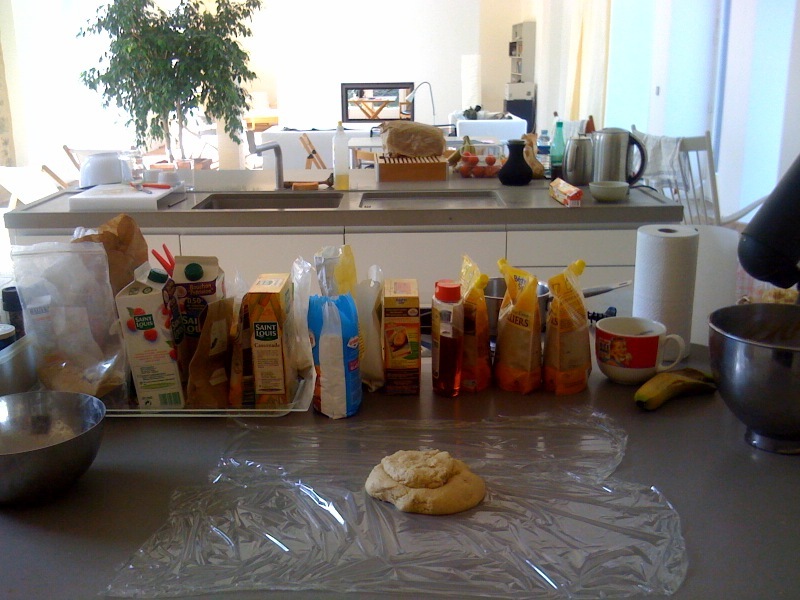 Living with young people in France, I’ve realized that not everyone actually lives like this. Gasp – some people buy store-bought bread! I thought everybody bought fresh baguettes everyday, and the butter in the fridge came from the farm, and families shopped for fruit and vegetables daily. The daily diet of a young person looks like this – beer, soda, chicken nuggets, McDonalds, fries, ham, mashed potatoes, pasta. People don’t make that much money, and processed, convenience foods are more readily available. It’s pretty expensive to eat even at a cafe, about $20 for just a sandwich and a drink. Maybe it’s time for France to offer some affordable, balanced meal options between $6 MacDo and $20 cafe food. Expand the Baja Fresh chain to Paris anyone? However, I do have to say that French people are still not as fat as Americans. 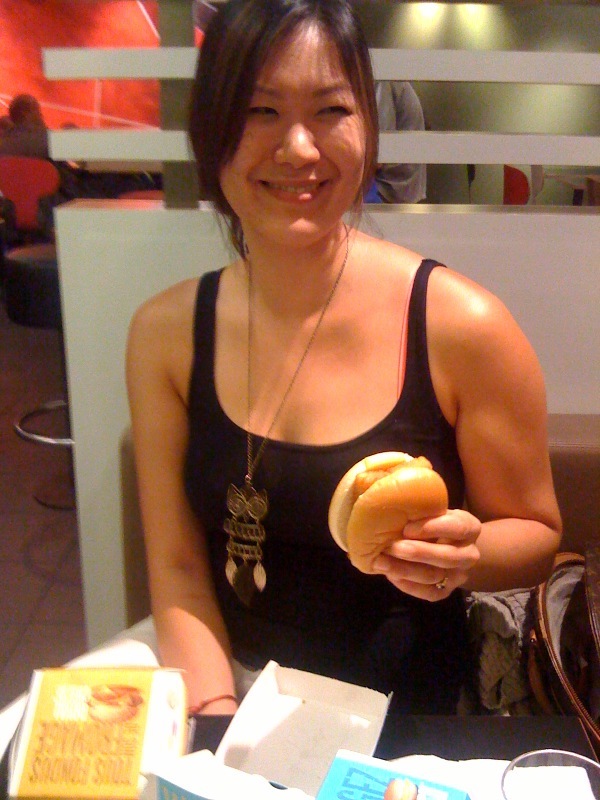 And I observed the French eating in McDonalds. First of all, sandwiches and drinks are smaller. Second, people sit down. and take their time to eat. Even though it’s crappy food, they actually take an hour or so, chew their food well, spend time with their friends and loved ones. Taking the time to nourish yourself, not just with food, but quality time with people you love and giving yourself a break. Those young people eating crappy food – even if they’re just heating up leftovers, they set the table with a plate, fork and knife, and drinks for each person. and Everyone eats meals together. There is no word for quality time in French, it’s just part of their daily lives. Visiting and eating, not living in, France Ivy? Your fotos are very appetizing! Looks like your tasting some of the “slow food movement” we wish was out here.